Jungle Island in Miami, Florida encompasses an array of animals and plants as well as exciting interactive activities and shows. The Winged Wonders show is held in a 1,200-seat amphitheater, and Wild Adventures is a wild safari adventure. The park evolved over the years under the direction of its current owners, who purchased the park in 1988. The positive outpour of years of growth in hopes of creating an eco-friendly environment is illustrated daily. In fact, the zoo's horizon couldn't look much brighter with its development system of beautiful plants cohabiting with exotic animals; it's a wonderful example of co-existence. The zoo engages in conservation efforts by protecting various natural ecosystems and exotic and rare animals. The focus is on educating the public about various plants and animals by interacting with visitors and ensuring they take away valuable information; this also helps the zoo's animals’ lifestyles. The zoo also implemented educational programs . The Conservation Education Center is one of Jungle Island Zoological Park's premium learning centers for the public, and it is still growing today. Jungle Island Zoological Park opened its doors in 1936, when it was originally called Parrot Jungle. Then it was renamed Parrot Jungle Island. It closed because of torrential Hurricane Andrew but reopened as Jungle Island in 2007. In fact, it was one of the first attractions for tourists to visit while in Miami when founders Louise and Franz Scherr first opened it. Since he owned a bird feed supply store, he was knowledgeable about various exotic birds, as well as flowers and other plants. This was the main reason for his innovative idea: to house various types of birds so they could freely fly as he presented audiences with a lecture on flowers, plants, and his birds. Over a million visitors head to the Zoological Park annually. One of the most fascinating birds rose to the top with his entertaining show here. Pinky, the high-wire bicycle riding cockatoo, proudly demonstrated his talents by walking across a wire at the zoo in front of numerous spectators when it first opened at its location in South Miami. 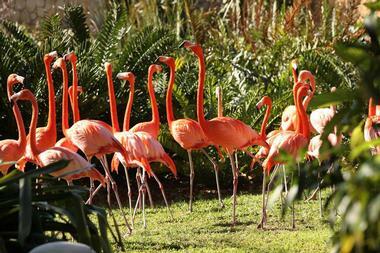 Also, their world-famous pink flamingos were featured in the opening credits of the hit series Miami Vice. When construction of the park on Watson Island was completed in 2003, the opening was named Jungle Island. The zoo is home to residents such as the rare fraternal orangutan twins Pumpkin and Peanut, both with their own unique traits: Pumpkin is quiet whereas Peanut is extroverted and energetic. There are also the veteran residents, Connie and Sinbad (the alpha male). Connie, the oldest of the orangutans, shares her primadome with him. They also participate in the orangutan school. Some other very unique orangutans in the bunch are the fashionista diva Hannah and the big man on campus Jake. Along the journey, you'll also see some primatessuch as the Squirral Monkeys with their echoing calls to one another and the terrestrial Hamadryas Baboons (Africa) who love to form clans. Other primates you'll see include the Gibbons,which aremembers of the lesser apes and are smaller and cuter in comparison to their great ape counterparts. You'll see chimpanzees and gorillas, as well, andthese guys are as big as humans! 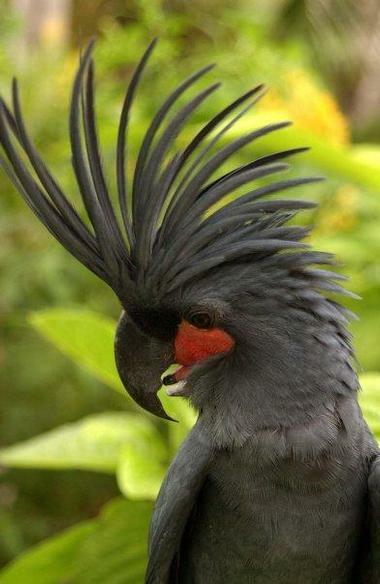 Plus, the great horned owl, the black palm cockatoo, and the Chinese silkie chicken will absolutely fascinate you. In addition to the animals that have been mentioned, you will also find a number of fish. In this part of the zoo, visitors will learn all about the tropical fish that call The Jungle Island their home. For instance, there are some beautiful Koi fish, which are considered a symbol of luck and can grow to be 3 feet long and live to be 30-40 years old. You can also discover the Florida Gar, a tropical fish that lives in the lowlands: streams, canals and lakes. There are some interesting facts about these tropical beauties you'll love hearing about. ome around the tigers and lion's den.Have you ever heard of a liger? Ligers are the largest cat in the world and have the same genes as the lions and tigers, yet they are considered the offspring of the two (aka dysphasia).They have the same unique traits of the two species. In fact, they don't even exist in the wild, which makes them as rare as an animal can get. Additionally, you'll find the smallest of the huge cats, which is the leopard. The leopard is reducing in numbers where it used to be abundant in Asia. Now, you can find them in the sub-Saharan Africa. Also in the mammals area is the Canadian Lynx. These guys are mainly found in Alaska across Canada and Northern America; they look more like a large house cat. The Lion’s Den is the park's largest area, and it is considered the most exciting exhibit. You'll be able to see the rare Snow White Tigers and the White Bengal tigers. Also, the rare color mutation of the Kruger subspecies of lion is a treat to see. The White lion, also considered a rarity is native to the South African Timbavati region. They are not albinos, as some may think. You'll also be able to see the Tabby Tigers. And for all those cat-lovers, engaging with some of the cubs is a delightful option when visiting Jungle Island. Eclectus Parrots are found in Australia, New Guinea, and the South Pacific Islands and can live 30 or more year. The Great-horned Owl “Moonlight” suffered a severe injury to her wing, requiring the tip to be amputated. Moonlight resides in the Serpentarium. Hyacinth Macaw are found in tropical South America, but their numbers in the wild are dwindling due to loss of habitat. Some estimates put the wild population at less than 3,000. Their population in captivity is thought to have exceeded that number, as their animated and comical personalities make them popular as pets. 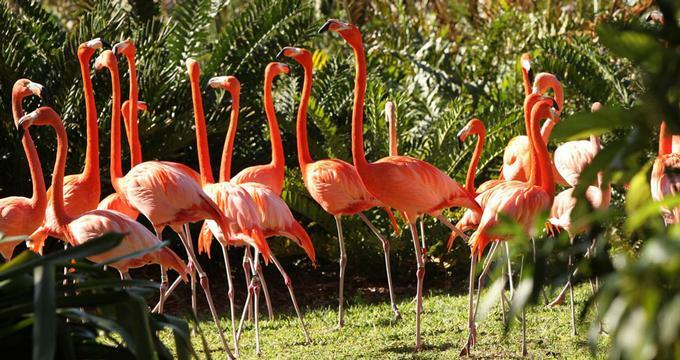 Caribbean Flamingos are one of six species of flamingos found around the world. They are easily identifiable by their pink feathers and long necks and legs. They are sociable and distinct birds that inhabit the shallow water ways of the Galapagos Islands, Southern Caribbean, Yucatan Peninsula, and Northern Caribbean. These are just a few of the many birds that you will see here at Parrot'dise. Next, the reptiles and amphibians will certainly open your eyes to more wonders of the animal kingdom. Some of the residents are the American Alligators, which are the largest reptiles in North America and can grow to be as large as 16 feet or longer. They can be found in the Southeastern parts of the US, in North and South Carolina, and, naturally, in Georgia and Florida. You’ll also see the Burmese Pythons, which you'll learn come from Southeast Asia. They are the third largest snakes in the world with lengths of up to 25 feet. They also weigh up to 400 pounds. Other reptiles and amphibians you'll be able to see at Jungle Island are the PueblanMilksnake and the White's Tree Frog. Bromeliads come from a family of monocot flowering plants. There are approximately 3,170 species native to the tropical Americas, with a few species that can be found in the American subtropics and in tropical West Africa. Cordia Lutea, known as yellow cordia, is a shrubby plant from the borage family Boraginaceae, which is native to the Galapagos Islands, mainland Peru, Ecuador, and the Marquesas Islands in Polynesia. They grow relatively large yellow flowers that are easily recognizable and also beautiful. Platycerium is a genus of about 18 fern species in the polypod family. They are widely known as staghorns or elkhorn ferns because of their uniquely shaped fronds. They are native to tropical and temperate areas of South America, Africa, Southeast Asia, Australia, and New Guinea. Tithonia Diversifolia, or the Mexican Daisy, is a favorite of bees and African farmers who have used the plant for organic fertilizer for vegetable crops in either compost or a tea form. It blooms throughout the year. 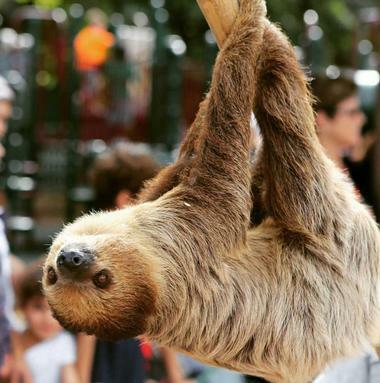 Jungle Island’s animal shows feature three of the wildest entertainment exhibitions of animals from around the globe. First is the Winged Wonders, with some of the most playful birds and stunt performers you'll have to see to believe. Another is the Wild Encounter where guests can view the presentations of some amazing felines. The Institute of Greatly Endangered and Rare Species (TIGERS) puts on the presentation, an awe-inspiring show that is part of the conservation educational organization. Afterward, guests can have their picture taken with the tiger cubs for a small fee. Third is the Wild Adventures where trained staff will be present as visitors are taught a few lessons about the jungle's most intriguing and unusual animals that the zoo houses. The zoo is known for allowing visitors to interact with the animals in various ways. This is where guests have the opportunity to enjoy a hands-on experience while they interact with the animals; additionally, even private sessions are available. Thus, the zoological park provides the public with the means to explore an eco-friendly environment and its conservation efforts. By exploring and providing the interaction between animals and the public, both learn from each other while exploring various activities that are safe with the trainers and zoo staff alongside. Programs and selected presentations that highlight the zoo's animals and plants are different in nature but still educational. For instance, an in-park presentation includes information on animals with different themes. These Educational presentations include the Rainforest Adventure where animals of the rainforest are housed and visitors will learn about their habitat and their environment. There is also a bird collection called "Parrot'dise , where each bird has an interesting characteristic or trait you'll learn to appreciate. There are also reptiles from various places of the world, plus the Everglades Encounter,which houses animals from the Everglades. And finally, the Animal Survivors 'Lessons allows visitors to learn about the defense mechanisms and survival techniques that animals use to survive in the wild. Your trip to the zoo will surely resonate with you. This experience of encountering rare animals such as the white tiger will open you and your family's eyes to the wonderful animals that exist in our world. The animals are divided into various exhibits. All the animal exhibits span within 22 acres of ecological friendly animals and plants living in unison; you can hear the laughter of kids and monkeys echoing across the roars of lions and tigers while visiting, which make your trip to the zoo even more inviting. Birds cuckooing in unison with the chirps of some of the most rare birds on the planet keep the visitors interested and entertained. The zoo is a conservative, eco-friendly zoological attraction for the public, and the evolution of its name, the Jungle Island signifies the unison of plant and animal in a monitored and safe place where visitors can view exciting live animal activities. Here are some of the exhibits you can look forward to when visiting Jungle Island. Also, with places like the Kangaroo Paddock, the Primadomes, or the Orangutan School you'll learn a lot about them. For instance, at the Kangaroo Konnection, located at the Kangaroo Paddock, you'll be able to interact with the small cuddly kangaroos! At the Manu Encounter, visitors can experience an interactive showcase with exotic macaws and other exotic animals. Plus, at the Tortoise Exhibit, visitors can enjoy the life-size giant tortoises. Some of the male tortoises can grow up to 500 pounds while being able to live up to 150 years! Additionally, a brief presentation on the habits and habitats of these animals will be given by one of the animal care trainers. Also, they will be present for a Q & A relating to exhibits such as the Petting Barn, which is located by the Children's Playground. Parrot Cove is a private beach and the only one in Miami with a "beach playground" that is both fun and challenging for even the avid athlete. Visitors will also be able to see downtown Miami and the beautiful Biscayne Bay while enjoying the fun under the sun. This area is only for guests of the park, which makes the special oasis all your own. Come and relax with others while lounging in chairs and cooling off by wading into the bay. The entrance of the beach is included with the cost of your entrance fee at the zoo. So, after spending that quality time with the fish, the orangutan bunch, the reptiles, tigers, lions, and exotic birds, you can go spend some time in the thrilling water playground called the Rainforest Riptide. 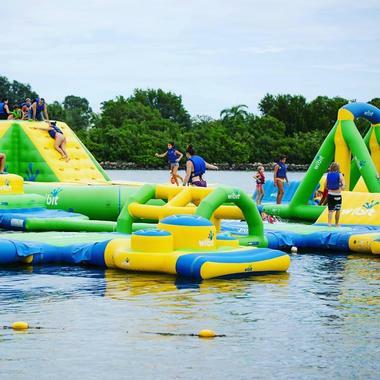 This larger-than-life thrilling playground features a series of fun obstacles, which includes trampolines, balance beams, action towers, cliffs, slides, and a swing. Test your endurance with the adjacent climbing wall in the Riptide. Participants must be at least 3 years old, and children under 8 must be accompanied by an adult. One of the on-going educational programs is the Jungle Slumber. This type of program is a great way to learn with friends or teammates about the elements of the ecological animal and plant system. While enjoying a night of fun-filled activities, for instance, there will be a "hike at night" to get the excitement going, plus a craft's project, interaction with some of the animals, and a Jungle Island Scavenger Hunt, and don't worry, you'll be fed too. The crew from the zoo will also provide breakfast and afterwards a day at the zoo. Plus, a Slumber Party is no party without a good ole' fashion group picture to help the memory of the Jungle Slumber last. You can choose from among the standard programs, or call the Education Department to develop a course that meets your group’s specific needs. Price is subject to sales tax. Reservations must be made in advance and are subject to availability. Contact the establishment about the Outreach Programs.For larger groups, lengths of the programs can be modified to fit those needs. For those teachers or parents who want their kids to continue learning about the importance of animals and their habitats, explore with a group on a field trip that is sure to have fun in the wild. One specific exhibit everyone enjoys is the Australian Red Kangaroo exhibit. Also, you can welcome the loveable Lemurs straight from Madagascar. Another marvel are the dressed up South African Penguins. There is no field trip without a journey to the Everglades Habitat, which is a replica of the Florida Everglades. Enjoy your exploration here. Because of The Endangered Species Act, alligator hunting is illegal. States such as Florida monitor animals like the alligator that are endangered or near extinction. Alligators are making a comeback. These species are definitely on the rise in many areas where they were once scarce. This is why Florida continues to thrive in monitoring and bringing awareness to the public about one of the oldest reptiles to date, and with the right educational resources and monitoring we hope to have them for thousands of years more. The park greatly values the zoo. Some of the animals will become endangered if society doesn’t take steps to protect them, so the zoo is staffed with excellent caregivers with extensive training who are happy to provide information to visitors. After walking through the lush greenery from one show to the next, you can still discover one of the best things to do in Miami. Guests can take their shopping to the Jungle Island at the Island Treasures Gift Shop. And if you want to continue shopping, downtown Miami has that too. The zoo enriches the lives of park visitors through offering them a chance to interact with exotic animals and plants. And while guests have this experience and entertain themselves with the creatures, they can enjoy the eco-friendly atmosphere at the zoo.